It's Time to Make Your Roof Stand Out! With this high level of experience, our team is more than ready to handle your construction or renovation project. You can trust the team at Cole Roofing & Construction to take care of you and to offer you a fair price. You can have confidence and peace of mind in choosing our family-owned and -operated North Carolina roofing and construction business for your next home improvement or repair project. Contact us at (919) 999-3669! At Cole Roofing & Construction, we are proud of our reputation for offering quality work at a fair price. Our team has been involved in a number of high-level construction projects, including jobs at the North Carolina's Governor's Mansion, the North Carolina Museum of History, the North Carolina Legislative building and several universities in the state. We have worked on homes across the Triangle and we give every customer the prioritization and respect they deserve. Our second-generation roofing and construction company operates under a simple but important policy: We treat every house we work on as if it were our house . This has been our commitment since we opened our doors more than 40 years ago and it remains our guiding principle. You can rely on the team at Cole Roofing & Construction to provide excellent service in a reasonable time frame with stunning results - all at a reasonable cost! Whether you have a renovation project in mind or you need extensive home repair, choose a team that is committed to your satisfaction. You have a vision for your dream home, and we have the experience and ability necessary to make it a reality. Contact Cole Roofing & Construction today to request a free estimate! 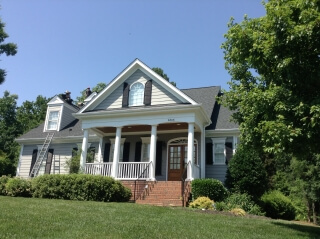 We offer residential and commercial roofing and construction services to customers in Durham, Chapel Hill, Graham, Sanford, Smithfield, Wake Forest, Raleigh, Apex, Cary, Carrboro, Hillsborough, Greensboro, Wilmington, and Burlington.